Born June 15, 2009, Sierra Mist Poco Twist is out of Pepsi Pocos LeoDandy by Sierras All The Gold. Sierras Mist. He has perfect conformation and is already showing signs that his strides will be as smooth and graceful as his father and as fast as his mother. A social young colt, Mister already leads, ties, lets us pick up his feet, touch his ears, and groom him all over. He is well socialized and willingly lets multiple children in our lesson groups touch him at once. He has all of the potential, attitude and breeding to be the perfect child safe horse or to develop into a champion reining mount. Sierras All The Gold is a born and bred working cow horse with a number of reining and cutting champions in his past. Quick on his feet and brave, Sierra has been used with cows and untrained broncs and has always stepped up to the plate. His conformation also puts him in any English category thanks to his flexibility and ability to gracefully maintain an arched head carriage. Pepsi Pocos LeoDandy is an offspring of the now deceased Pepsi Poco, renowned for producing reining champions. His offspring have earned numerous awards. 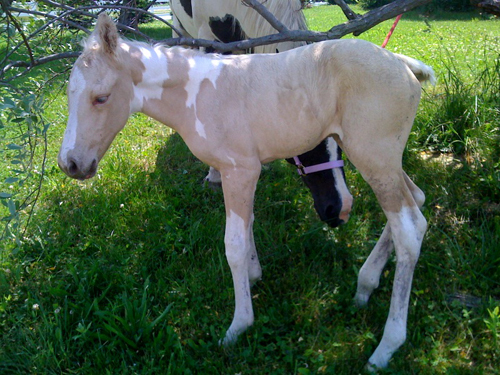 Pepsi is 15.1hh black and white tobiano. She has a steady character and is safe with children. She is built like the old-style quarter horses, heavy, sturdy and strong legged, with speed and muscle to match. Mister was gelded on July 10, 2010.